l-r: CSHL President & CEO Dr. Bruce Stillman; MWCABC VP of Research Barbara Buckley; CSHL postdoctoral researcher Dr. Sarah Diermeier; CSHL Professor & Director of Research Dr. David L. Spector. 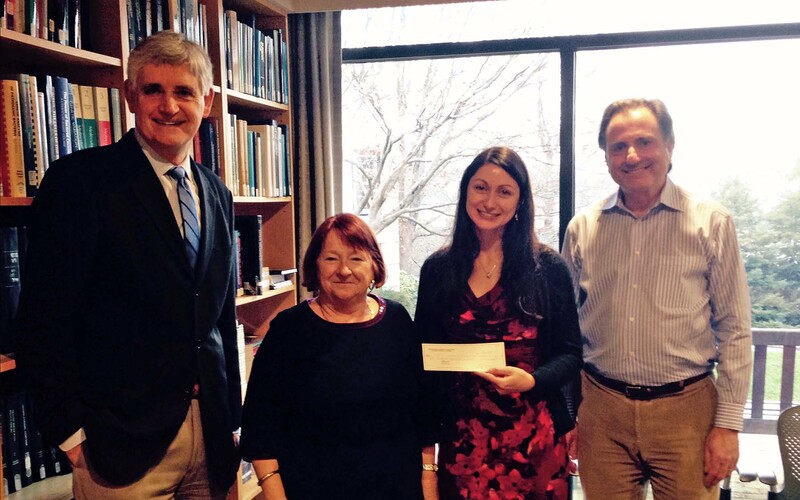 Since 1999, CSHL has received over $400,000 in funding for breast cancer research from MWCABC. Cold Spring Harbor, NY — On December 22, the Manhasset Women’s Coalition Against Breast Cancer (MWCABC) donated $100,000 to Cold Spring Harbor Laboratory (CSHL) to support breast cancer research. Barbara Buckley, Vice President of Research at MWCABC, presented the check to CSHL postdoctoral breast cancer researcher Dr. Sarah Diermeier. She was joined in the ceremony by CSHL President and CEO Dr. Bruce Stillman and CSHL Professor and Director of Research Dr. David L. Spector. Since 1999, CSHL has received over $400,000 in funding for breast cancer research from MWCABC. Diermeier is using mouse models that closely resemble two of the most prevalent forms of human breast cancer to isolate malignant ductal cells. By comparing cancer cells to normal cells, she hopes to identify new therapeutic targets for this deadly disease. Her work focuses on an exciting new class of molecules in the cell, called long non-coding RNAs (lncRNAs). Diermeier’s project will provide a deeper understanding of the role of these RNAs during tumor progression and most importantly metastasis, the main cause of breast cancer-related deaths. Diermeier conducts her research in the Spector laboratory.